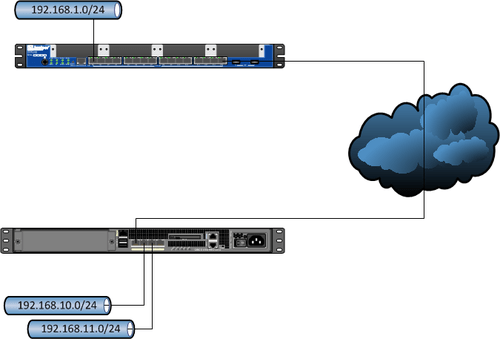 Take the example below, where the SRX has a network of 192.168.1.0/24, and needs to access 192.168.10.0/24 and 192.168.11.0/24 which is behind a Cisco ASA. The st0.0 address must use a subnet for its local address, and the NHTB address are ephermal (they don’t exist on the cisco side); they just need to be unique for each vpn. If you have multiple source subnets headed to the same destination then you will need to perform policy-based VPNs. This is because there is no way to specify the same destination subnet across two separate interfaces. In the case above we are using a single source subnet so this above configuration should work. Abdel, you should be able to “load merge” these commands into junos. That should help you out! I think new traffic selectors option help with this situation so one can achieve this using one ipsec vpn object.